Vivo is all set to unveil its latest Vivo V9 smartphone in India at an event slated for March 23. While the Chinese phone maker has not yet revealed information around the phone's hardware specifications, pricing details, or any other features, several online leaks have emerged that give us a clearer picture about the Vivo V9. The new leaks detail the phone's internals, and also feature hands on images, pricing information, and availability in certain Southeast Asian markets. Official retail boxes of the handsets are also apparently seen in another set of leaks. The first, and most substantial, leak comes all the way from Indonesia. A Twitter user got hold of screenshots from an e-commerce website in Indonesia which seems to have listed the Vivo V9 with press renders, price, and most internal specifications. Price of the smartphone is listed as IDR 4,999,000 (roughly Rs. 23,700). Apart from that, the listing also reveals hardware specifications - a 6.0-inch full-HD+ (1080x2160 pixels) AMOLED display, a Snapdragon 660 SoC, 4GB RAM, 64GB inbuilt storage, and a dual rear camera (12-megapixel + 8-megapixel) combo. The phone is also said to run FunTouch OS 4.0 on top of Android 8.0 Oreo out-of-the-box. Other specifications listed include a 24-megapixel wide-angle selfie camera, Face Unlock, fingerprint sensor, fast charging 3250mAh battery, and 4G LTE. Software features on the Vivo V9 are said to include Apps Clone and FiturSmart Split 2.0. Two other leaks from Indonesia and Thailand allegedly show the retail box of the upcoming Vivo V9. 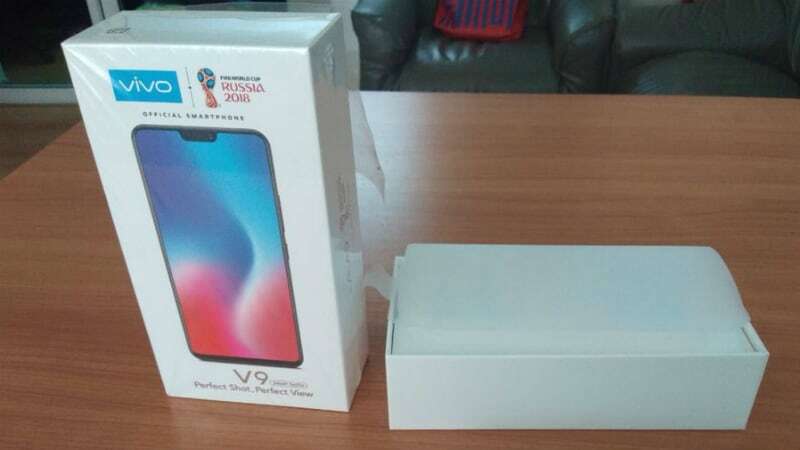 The box comes with FIFA World Cup 2018 branding and looks very similar to iPhone packaging; the handset with the notch isn't that different from the iPhone X's design philosophy either. Separately, a probable successor to the Vivo X20 is expected to launch in China on March 19. The Vivo X21 has been teased on Weibo, and is rumoured to sport an under-display fingerprint sensor much like the one seen on the company's X20 Plus UD smartphone.